Parfait Cottage pour passer du temps en famille et ensuite aller à la plage! Emplacement, emplacement. Ce chalet est situé sur une baie tranquille avec accès à deux zones distinctes: une plage à seulement 5 minutes à pied; l'autre à 10 min et une rampe de lancement juste en bas de la route. Il dispose d'un salon / salle à manger ouvert avec des portes-fenêtres menant à la véranda. Deux chambres en haut, deux en bas. Une salle de bain avec douche, une salle de bain avec baignoire bas pour les enfants. Parc à bébé disponible sur demande. Vaste espace de stationnement et de Victoria Beach est seulement une promenade à vélo de suite! La propriété a un trou à feu, barbecue, vélos de plage, douche extérieure pour se nettoyer de la plage, les fans, cafetière, grille-pain et micro-ondes. Dépanneurs, vendeur de bière, de boulangerie et salon de crème glacée sont tous relativement proche. Vous trouverez 2 parcours de golf à proximité ou profiter de votre journée canoë / kayak à Elk Island. Ceci est un endroit fantastique pour les sports nautiques et la pêche! A voir et de rester la propriété !! Les clients sont priés d'apporter leurs propres oreillers, serviettes (plage, les mains et serviettes de bain) et un sèche-cheveux si nécessaire. We really enjoyed our stay here! There was plenty of room for our large family. 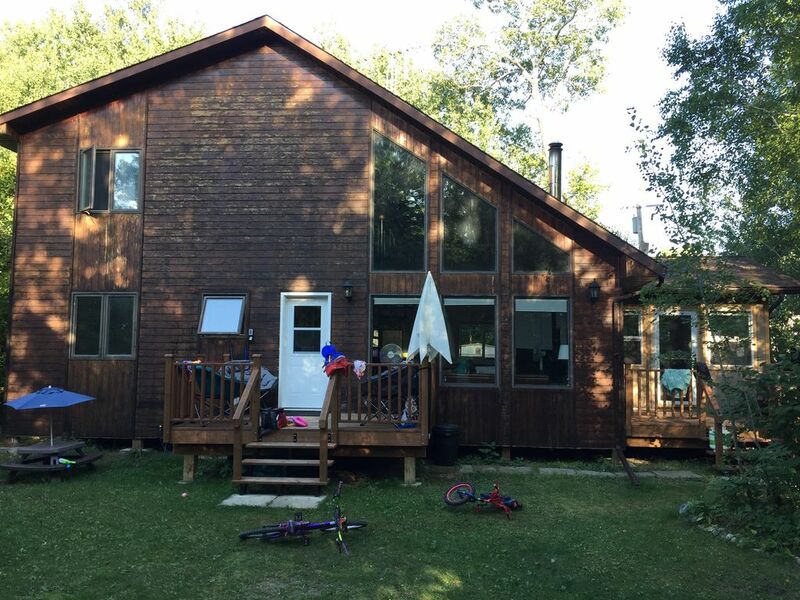 The cabin is very inviting, with cosy nooks for relaxing, comfortable beds, plenty of board games, a nice outdoor firepit, and lots of toys/books for the kids to play with. We appreciated that there weren't many breakables within reach of our busy toddlers. The only reason I gave this 4 stars, instead of 5, is that it wasn't as close to the water as we had imagined. In addition, the indoor wood stove isn't functional, which was too bad as we would have loved a cosy fire during our rainy stay. All in all, we had a fabulous stay, and would definitely stay again. The hosts were incredibly accommodating and were very quick to respond to any questions/concerns we had during our stay. Thanks again for opening your space to us! Thank you for all your kind words. We are very honoured you picked us to stay with and I hope you stay with us again in the future! Our greatest concern is the safety of our guests. The wood stove inside the beach house is off limits to guests as it is not up to today’s fire codes and as such is stated in the details of the listing. We would be devastated should anything happen to you and your loved ones during your stay and we will gladly take a 4 star rating any day if it meant you were safe. The walk or bike ride to the beach however we cannot control. It takes under 15 minutes to get to the big one if you are walking and 5 minutes if you take one of our bikes free to you to use during your stay. I can say, the time it takes to reach the beach is well worth it!!! We loved our stay at this beautiful Sandy Bay cottage! We chose this as a meeting place for our family, one side driving from Ontario, the other driving from BC. It was perfect. So much to offer for the toddlers who were part of our group. Toys, books, games, all right there to keep them occupied and happy. Plus, the backyard was the perfect spot to play. We saw deer, frogs, and even witnessed an amazing lightning storm, which we never see on the west coast. And the beach!! Stunning. And basically our own private spot. The water was shallow and perfect for the little ones to play around. The cottage is comfortable for families and the design and décor were so lovely. Really has such a beach house feel to it. We loved it. If only we could move it to the Vancouver area so that we could visit more often! Thank you so much!! Thank-you so much for staying with us! It makes me smile knowing how much you enjoyed your time at our beach house. We hope to see you again soon. Great property with wonderful beach. Enjoyed everything about our stay. Loved walk to beach. Lots of room for 6 adults and two children. Little disappointed with bikes. Really only one usable bike. Still give 5 stars for the overall experience. Thank you for your kind words. We are very happy you enjoyed your stay. Our apologies for the disappointment with the bikes. Every week we do our best to ensure your comfort is our number one concern, however sometimes damage is caused and we are unable to repair the situation on the spot. During your stay a few bikes needed new tires and we did not have the supplies on hand. We will ensure to change this moving forward. Quiet, well maintained and located close to the beach and other areas. Great entertaining facilities. Good for kids. The sunroom was just especially useful and fun space. Our family had an amazing time in the cabin. There are plenty of toys and games inside the cabin for a rainy day and the veranda is a perfect spot to curl up and read a book. The cabin is clean, open and comfortable. It is located close to a quiet, beautiful sandy beach. I would highly recommend this cabin to others. We stayed for 2 weeks in August and could have stayed longer. The cottage has soaring ceilings, lots of seating areas (living room, screened in porch, 3 decks and back yard), all the kitchen amenities (dish soap, garbage bags, tea towels, electric kettle, dishes, knives - it is stocked! ), 3 king size beds and 2 double/twin bunk beds, lots of fans for hot nights, beach gear, bikes for adults and a peaceful, quiet location. We were initially interested in staying right in Victoria beach but we're so happy we went with this location instead. VB is a quick bike ride along a beautiful trail if you want to visit the park there or pick up some Enfield's baked goods, but you have a fabulous beach (and pond) a short walk from this cottage. You can also walk up the beach here to cross over to Elk Island. This is where we'll stay next time we come to Manitoba for a beach vacation - just a magical place! Notre propriété de location n'est pas à VICTORIA BEACH, mais il est situé dans la plage R. M de Victoria et est à 10 minutes en voiture. We require 60 days cancellation notice for a full refund of deposit. Anything less than 60 days notice will forfeit your deposit. NO exceptions.